In relation to cryptocurrencies, we can see how many projects want to adopt routines, services, programs, and others to the industry led by Bitcoin, the goals are always to seek the criticism of the clients, look for the mistakes of the companies daily and improve them and turn them into a project where you can benefit from the payment in cryptocurrencies. 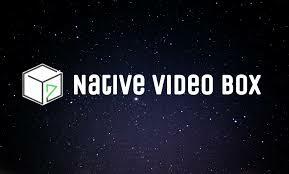 One of the projects that I want to talk about today is about Native Video Box, which is a native independent video platform where its focus is on ecological native advertising, this platform allows all sites to improve their users experience with content relevant. The way in which Native Video Box (NVB) works in terms of revenue is as follows: they share 75% of the revenue from ad visits with video owners that account for 15% and the owners of websites 60%, who are the ones who create video content and who take it to the audience. The way in which these revenues are distributed makes them a totally transparent platform, which gives them high growth in their network and a high standard of inventory quality. How does tokenization technology work? Tokens and blockchain made it possible to implement Native Video Box ecosystem that resembles YouTube like cryptocurrencies resemble traditional banks. Token sale results will be used to develop that fair and effective ecosystem. In short, this platform works when anyone visits one of the websites of the NVB advertising network, using algorithms. The system automatically selects most of the relevant videos from the NVB video base. The miniatures will be shown to the visitors with brief descriptions and the person will choose the video that they like the most, immediately a video player opens showing the video, but before the video starts playing the video will appear a pre-roll ad, which is an advertising video of 15 seconds in length. All the revenue obtained from publicity is shared between the webmasters, the owners of the rights and a platform.